It seems only yesterday when a rare Monk Mail, from the submission form on this website, alerted me to the debut recording by the Ukrainian Post-Punk band ПРЕДСМЕРТНАЯ КАДРИЛЬ. Curious, I sampled it and didn’t wait for the song to end before buying their download on Bandcamp. It’s another year later now, and the band that translates to Dying Quadrille have chalked up another step forward in their development. There are a number of changes apparent when listening to “Прости” not the least of which is the preponderance of faster tempos. Never more manifest than on “Трагедия” where the drumming from Andrej favored motorik tattoos of a furious pace as matched in intensity by Igor’s guitar, which still tantalizingly contained surf rock in its DNA, though less than before. The first album’s gambit of fluid tempos; beginning slowly and building in intensity is largely abandoned here for a straight up onslaught of velocity. Only “Похмелье” revisits that technique. Its clean, angular riffs in the intro also downplay much of the thunderous reverb the band usually employ on the guitar and Alex’s vocals only join the song nearly a minute and a half into its length. Leading me to expect an instrumental, but once he began singing the tempo then modulated faster for the chorus and slower for the remaining verses of the song. The title track was thrilling, breakneck Post-Punk that was built for a chase sequence in a thriller; its tightly coiled riffs trading for soaring chords on the chorus and middle eight. When the song faded out on a particularly hot solo on the fadeout I was hungry for more. Well, what do they say in this business called show? Always leave ’em wanting more. “Дерево” led for a change with Dasha’s bass before some truly glorious guitar cascades took the intro over the top to make this song one of the rare beacons of positivity in this normally dour band. At least musically. Alex’s vocal delivery favored the accusatory tone that I associate with Howard Devoto on this one. Any bands who have looked to Devoto or John McGeoch for inspiration, as I would think that ПРЕДСМЕРТНАЯ КАДРИЛЬ have, are doing something very right. 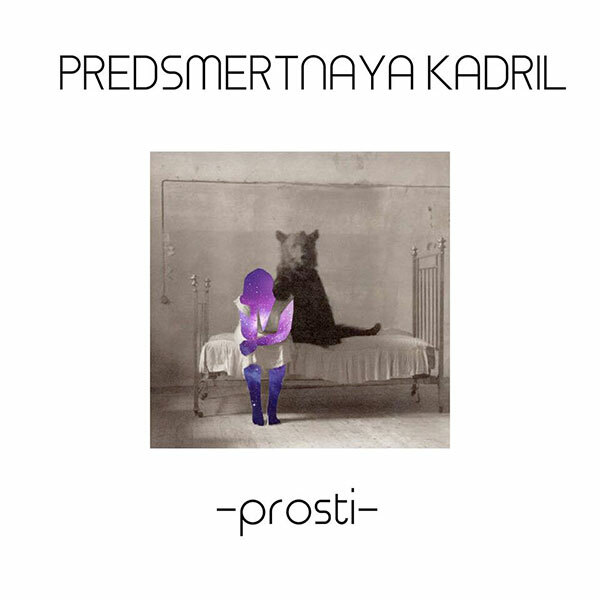 “Прости” [Forgive] was a consolidation of the synthsizer-free guitar-based Post-Punk that ПРЕДСМЕРТНАЯ КАДРИЛЬ began releasing last year and they have not re-thought their aims as much as committed to honing their already sharp vision. That shows that the band have a firm grasp on their strengths as they deliver powerful darkness that does not yield to defeat, and shows a spirited defiance of the status quo. In these dark times, we sometimes need dark music to help us get through the adversity. I look forward to where they go next. Until then, you can purchase here. This entry was posted in Record Review and tagged 2017, ПРЕДСМЕРТНАЯ КАДРИЛЬ, Ukraine. Bookmark the permalink.